Glenroy is a charming old home with wide verandahs along its length, a peaked thatched roof and metre thick "pise de terre" walls. 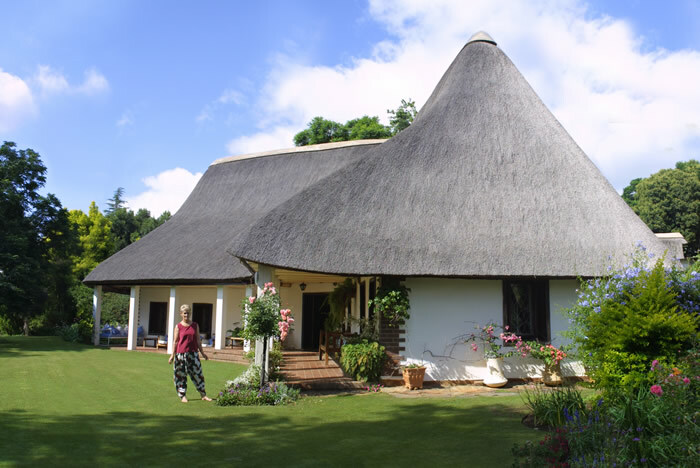 The house is set in an idyllic garden overlooking Wagendrift Dam. Inside, the house has a guest lounge, with wood fires in winter. In the summer, a swimming pool is at your disposal. See the facilities section for more information. Conveniently located, we are a scenic 8km drive from Estcourt and a short drive from the Central Drakensberg and Midlands Battlefields sites. We are also a 5 minute drive from Wagendrift Dam, which offers activities as diverse as fishing and waterskiing. See the attractions section for more information. You can choose to structure your own activities, using Glenroy as a base. Book out the whole house, a room, or a shared room. The house is well suited for self-catering, but meals can be provided on request. See the booking section for options and prices. Or for a more structured experience, join one of our tours. See the tours section for details. To find out what people are saying about us, see the Feedback section above, or visit our new Facebook page.